Theresa May could suffer a third major Commons defeat on her deal. UK Prime Minister Theresa May moves to an exit from the Office of Prime Minister over the Brexit Withdrawal Agreement with the European Union (EU). In a desperate move to get her Agreement adopted by the House of Commons, she offered to resign once the Agreement is passed in the Commons, and not lead the next stage of Brexit negotiations with the EU. The Agreement was twice defeated by large majorities of 230 and 149 votes. The end of her premiership was signaled with the resounding failure to ensure a majority support for May’s Brexit Agreement, when it is next voted on. The switch by several Conservative MPs and Cabinet Ministers critical of her, including her main Tory leadership challenger, Boris Johnson, to support her in this final move, will not get her the majority vote. Her political ally, Northern Ireland’s Democratic Unionist Party (DUP), which gives a slender majority to May’s government, will not support her Brexit deal if put to a vote again. The next voting on Brexit in the Commons is due on Friday 29, or Monday, April 1. A large number of Conservative members, including several Cabinet members who resigned recently, and most Opposition votes are against the May Agreement on Brexit. Hopes of getting some Labour rebels to support Theresa May in this move is also unlikely as the possibility of the next PM is Boris Johnson. The divisions in the Conservative Party Boris Johnson is seen by Boris Johnson telling friends that Theresa May’s deal is ‘dead’, despite agreeing to back it over her promise to resign, as reported in the Evening Standard. Earlier this week, MPs in the Commons failed to break the Brexit impasse after they were unable to find a Commons majority for any Brexit plan, despite voting on eight different options, in an Indicative Vote process, after MPs seized control of the agenda in the Commons from the Executive. This was a move against Theresa May’s continued push for her own policy on Brexit, and failure to reach understandings with other political parties. Increasing calls are coming for a general election to elect a new government, in the context of the overall failure of Theresa May and the Conservatives on the Brexit process. The EU leaders have also made public statements this week that the UK should give ear to the increasing public call to move away from Brexit or hold a second referendum on the issue. The politics in the UK, increasingly divisive in recent months, especially over the Brexit process and Theresa May’s leadership, will remain factious as the Conservatives seek a new Prime Minister and the country moves to a General Election. The Indian Congress Party has announced its main propaganda drive in the campaign for the coming elections to the Lok Sabha. Congress leader Rahul Gandhi declared a “final assault on poverty” if the party is elected in the elections in May, by giving a guaranteed income to 250 million of the country’s poorest citizens. In a tough fight with the Prime Minister Narendra Modi and ruling Bharatiya Janatha Party (BJP), the Congress plan offers every family benefitting from this scheme a guaranteed income of Rs. 12,000 per month. The scheme would be known as Nyay – meaning Justice - an acronym for Nyuntam Aay Yojana. The Nyay proposal recalls the Garibi Hatao (“Remove poverty”) theme and slogan of Indira Gandhi's 1971 election campaign, later also used by her son Rajiv Gandhi. This theme is now used by her grandson Rahul Gandhi with Nyay – or Justice, in an anti-poverty programme seeking national support based on rural and urban poor. There are many questions raised about the success of the move against the Narendra Modi campaign, which has so far brought considerable success to the BJP and its allies in the electoral race. The Congress Party has been considering a Universal Basic Income (UBI), gaining recognition in the West, for some time. The ruling BJP has said the Congress plan unaffordable. “If you are sure about your defeat, you can promise [the] moon,” the party’s general secretary, Ram Madhav, tweeted. The BJP has previously said the government had examined a UBI in 2014, but concluded that eliminating all subsidies would provide only enough funds to pay 6,000 rupees per family a month; less than what is required to feed them. However, Narendra Modi has been supportive of a monthly payment of Rs. 6,000 per family to the vast poor population in India. The Rajiv Gandhi ‘Nyay’ move for Rs.12, 000 per month challenges the Modi initiatives on fighting poverty in India. Gandhi and the Congress are fighting a difficult election campaign against Narendra Modi and the BJP. Modi’s popularity did receive a boost from recent military clashes with Pakistan, and the issue of national security is strongly promoted in the BJP polls campaign. In a surprise move, clearly directed at the polls campaign, PM Narendra Modi made an unexpected address to the nation this Wednesday, stating that India was now an ‘established space power’ and in space’s ‘super league’ because it had successfully shot down a low-orbit satellite in a missile test. Modi said with the successful launch of an anti-satellite missile (ASAT), India has become only the fourth country after the US, China and Russia to have this technology. He said that it would “make India stronger, even more secure and will further peace and harmony”. 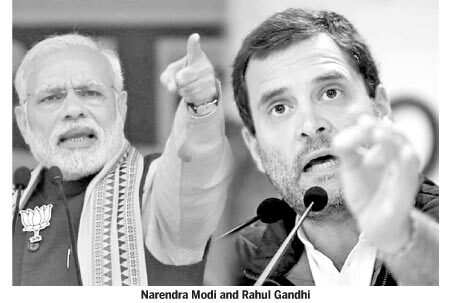 This is clearly taking the current Indian general election contest to the heights of space, and underscoring the importance the BJP attaches to the defence and security issues in this campaign, when it is being challenged on issues of poverty, unemployment, agricultural issues and challenges faced by youth by the opposition parties. The Indian elections begins on April 11, and the contests are getting more intense, with the BJP in the lead, but not certain of a majority in the Lok Sabha. China had considerable success in economic and strategic moves in Europe this week, with Italy, a member of the G7 countries and a founder of the European Union, signing up to China’s ‘Belt and Road’ initiative, with considerable port, infrastructure and trade facilities in Italy, and moves to promote Italian goods in China, following the visit to Italy of Chinese President Xi Jinping. The Chinese President also visited France, where agreements were signed for the sale of 300 aircraft from France to China. These would be 290 Airbus A320 and 10 Airbus A 350 aircraft. It is estimated the price would be Euro 30 billion (US$ 34 billion). Several other bilateral agreements between China and France were also signed relating to technology, food industry and renewable energy. President Xi’s move in Europe comes amidst the increasing opposition from the USA to expanded trade deals with China, and the call by the US for European countries not to be associated with use and promotion of the Chinese Huawei company on digital technology, especially the 5G technology. While welcoming the Chinese President, the French President Emmanuel Macron also sought to address China’s global ambitions, seeking reciprocity in European trade deals with Beijing. President Macron arranged for the Chinese President to also meet German Chancellor Angela Merkel and the European Commission President Jean Claude Junker in Paris for foursome talks on new relations between China and Europe. There is friction in the relations between Europe and China, but the need to engage in wider trade with the rapidly expanding Chinese economy is pushing Europe away from US concerns. France is seeking more Chinese support for the French-backed G5 Sahel force fighting Islamic extremists in Western Africa. President Macron will seek to use a diplomatic initiative to prevent unsustainable debts to China from African countries, as the Chinese Silk Road initiative helps to build many infrastructure projects in Africa. French President Macron’s efforts to forge a united European Front against or to compete with China will not be easy, with the rising economic clout of the Asian economic giant, and the interest that many European countries have in benefitting from trade and other economic ties with China. US President Donald Trump is on a political rise after Special Counsel Robert Mueller’s probe report on Russian involvement in the 2016 US Presidential election, and Trump’s alleged colluding, found there was no collusion by Trump. This is what Trump has been reciting as a political chorus for the past two years, saying the Mueller probe was a witch-hunt. The US Attorney General William Barr, Trump nominee, in a summary of the Mueller Report has clearly said there was no Trump collusion. However, there is a rising problem whether the report has accused or shown instances where action could be initiated against President Trump for judicial interference. This will be the key to the new anti-Trump political campaigning by the Democrats, in a situation where Donald Trump has an assurance of retaining his Republican vote base. He has already launched his campaign for the coming 2020 Presidential poll, with strong attacks on the Democrats, and moving to support the legal moves to push for the complete elimination of the Affordable Care Act, the Obama Healthcare move – in the courts. If this succeeds millions of Americans will lose their private insurance on Medicaid coverage and there is likely to be chaos in the US healthcare system. In another key political move, relating to Foreign Affairs, President Trump signed the US’s recognition of the Golan Heights, in Syrian property, as belonging to Israel. The move will get strong support to Israeli leader Benjamin Netanyahu in the election he is facing, while also leading to a major change in US relations with the Middle East. The Trump move on Golan Heights is wholly against the UN position on the region, which is considered a region of conflict. This proceeds with Trump’s earlier decision to recognize Jerusalem as the capital of Israel.